The number one question I get from ecommerce business owners, whether they’re just starting out or making $4MM a year, is: how do I scale? If you’re asking yourself that question, this episode is for you. In today’s Flash Episode I’ll walk through the big picture strategy that will help guide you on the path to 8 figures. We’ll talk about the three phases of growth, from $0 to $10MM, and what you should be doing at each phase in order to grow your business. I’ll talk about how your role as a business owner will evolve as your company scales, and the three levers you should focus on to scale your business. And, I’ll share my #1 piece of advice for what you can do today to kickstart your growth. 4:03 (Phase 1) The importance of finding a marketing channel that works for you, learning it well and doubling down on it. 5:36 (Phase 2) Now that you’ve mastered the channel, here’s why you need to remove yourself to continue growing. 7:41 Once you’ve found your replacement, its time to focus on increasing these key metrics. 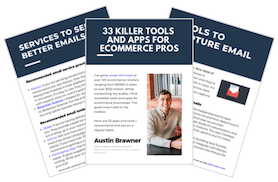 8:47 How email is still king when it comes to increasing buyer frequency. 11:25 (Phase 3) If 8 figures are in sight, it might be time to step out of the way and hire a team to take over. 13:59 How developing a hiring plan can increase your growth. 14:55 The one thing you should never expect when hiring someone to replace you in a role.